Josh Mylne grew up on the rural Darling Downs in Queensland before moving to ‘the big smoke’ for his university education at UQ. After a PhD in Arabidopsis molecular biology with Jimmy Botella, Josh’s first post-doc was with Caroline Dean at the John Innes Centre in Norwich (UK) where he worked on Arabidopsis developmental genetics and epigenetics. 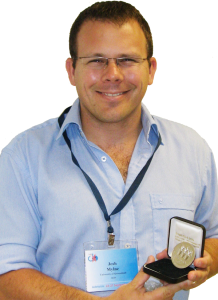 He made an unorthodox return to Australia in 2006, being recruited by drug designer and NMR spectroscopist David Craik of the Chemistry & Structural Biology Division at the Institute for Molecular Bioscience – a principally biomedical research institute. Soon after, Josh was awarded an ARC QEII fellowship at IMB and began using multi-disciplinary approaches spanning NMR and classical Arabidopsis genetics to understand plant peptide biosynthesis and biochemistry. The major discovery that formed the basis for his Goldacre Award was revealing the unusual biosynthetic route for a small ultra-stable peptide in sunflower. 2012 Goldacre Awarde Dr Josh Mylne. Sunflowers contain a small protein ring, called SFTI, found over a decade ago and whose ability to block proteases and super-stability has inspired its use a drug lead. Proteases are secreted by tumours to consume the flesh surrounding them and create a physical space for them to grow into. Blocking their action is part-and-parcel of most courses of anti-cancer treatment. Josh discovered the gene that encoded SFTI and found it was buried in a much larger protein of completely different function; a seed storage napin-type albumin (Mylne et al. 2011). For two completely unrelated proteins to be born out of one precursor protein is exceedingly rare. Josh demonstrated that the same enzyme that matures napin into its final form is the one that snips out SFTI and is the most likely candidate for gluing the ends together to form the ring. The notion of simultaneous cleavage and ligation by this enzyme (asparaginyl endo-peptidase) was bolstered by a recent paper (Mylne et al., 2012) that showed an almost identical biosynthetic route for a completely different cyclic peptide coming from a wildly different precursor protein. The 2011 UQ press release “Cancer drug found hiding in sunflower seed protein” went ‘viral’ internationally and was translated into several languages. The discovery made prime time national TV and the work featured in articles in COSMOS, Australian Life Scientist and Australasian Science. It featured at the 2011 International Botanical Congress in Melbourne and the article is being cited so heavily as to fall in the top 0.01% of 2011 articles in the field of Plant and Animal Sciences. Josh was subsequently awarded an ARC Discovery Project to pursue this biosynthesis further, while applications of the sunflower biosynthesis formed the foundation for a successful NHMRC grant to Prof Craik and Josh. The work on these biosyntheses has provoked an interest in the origin of proteins as for each biosynthesis to be ‘born’ required unusual genetic events. “Genetic evolution of plant proteins with biomedical applications” is the title of Josh’s ARC Future Fellowship which he will take up in Perth at the beginning of 2013. Here Josh will join the UWA School of Chemistry & Biochemistry and will work closely with UWA researchers from the ARC Centre of Excellence in Plant Energy Biology, which hosts a well-known cluster of Arabidopsis researchers (Small, Whelan, Millar, Smith) as well as its recently appointed, ex-Salk Institute superstar Ryan Lister. Josh’s post-doctoral training in molecular genetics and recent training in biochemistry and structural biology will allow him to bring all these approaches to bear on problems which will help us better understand genes, proteins and drugs. Anyone interested in reading more on his work, should visit the website www.mylne.org. Mylne, Chan, Chanson, Daly, Schaefer, Bailey, Nguyencong, Cascales, Craik. (2012) Cyclic peptides arising by evolutionary parallelism via asparaginyl-endopeptidase mediated biosynthesis. Plant Cell, 24: 2765-2778.